This article is about the newspaper. For the book publisher, see World Publishing Company. The World-Herald was the largest employee-owned newspaper in the United States. On November 30, 2011, Warren Buffett's Berkshire Hathaway announced plans to buy the newspaper. The World-Herald had for many years been the newspaper with the highest penetration rate – the percentage of people who subscribe to the publication within the paper's home circulation area – in the United States. The Omaha World-Herald Company also operates the website Omaha.com, the region's most popular website by all measures of traffic. The company dubs its downtown Omaha production center the John Gottschalk Freedom Center. The Freedom Center also houses its three printing presses, which can each print 75,000 papers per hour, and are considered to be some of the most advanced in the world. In 2006, the company purchased the 16-story former Northwestern Bell/Qwest Communications building in downtown Omaha as a new base for its news, editorial, circulation and business operations. The newspaper has bureaus in Lincoln, Nebraska, and Washington, D.C. Throughout the region, The World-Herald's parent company also owns smaller daily and weekly newspapers, which contribute to its World-Herald News Service. The World-Herald has won three Pulitzer Prizes, including the esteemed Pulitzer Prize for Public Service, awarded in 1943. 1920 Pulitzer Prize for Editorial Writing: Harvey E. Newbranch for an editorial entitled "Law and the Jungle," which decried the lynching of a black man on the lawn of the Douglas County Courthouse. Newbranch was the first editorial writer to win a Pulitzer under his own name—as opposed to awards for unsigned staff editorials—in opinion writing. 1943 Pulitzer Prize for Public Service: For its initiative and originality in planning a statewide campaign for the collection of scrap metal for the war effort. The Nebraska plan was adopted on a national scale by the daily newspapers, resulting in a united effort which succeeded in supplying American war industries with necessary scrap material. 1944 Pulitzer Prize for Photography: Earle L. Bunker for his photo entitled "Homecoming". The newspaper was founded in 1885 by Gilbert M. Hitchcock as the Omaha Evening World. It purchased George L. Miller's Omaha Herald in 1889. The paper was established as an independent political voice but quickly moved to the Democratic Party column. William Jennings Bryan was its editor in 1894–1896. Hitchcock served three terms in the U.S. House of Representatives and, starting in 1911, two Senate terms. It was a more objective voice than the Omaha Bee, which tended to sensationalize news to drum up sales. His son-in-law, Henry Doorly, took control of the paper after Hitchcock's death in 1934. The editorial page began leaning Republican after Hitchcock's death. Over his lifetime, Doorly served 58 years at the paper. In 1963, the World Publishing Company, owned solely by heirs of the Hitchcock/Doorly families, sold the World-Herald to local businessman Peter Kiewit, a construction magnate whose namesake company is a member of the Fortune 500. When he died, Kiewit left provisions in his will to ensure that the paper would remain locally owned, with a large part of the plan securing employee ownership. ^ "Staying the Course | American Journalism Review". Ajr.org. Retrieved 2010-08-28. ^ McMeekin, T. "Integration key to smooth operations at Omaha World-Herald," Newspapers and Technology. Retrieved 7/24/08. ^ "The Pulitzer Prizes | Search: omaha". Pulitzer.org. Retrieved 2010-08-28. ^ "Omaha Press Club Honors 'Hall Of Famers' - Omaha News Story - KETV Omaha". Ketv.com. 2008-05-29. Archived from the original on 2011-09-22. Retrieved 2010-08-28. 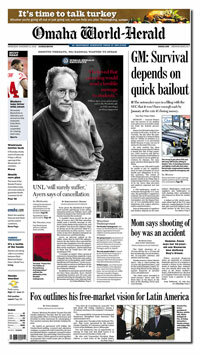 ^ Omaha World-Herald (2011-11-30). "Buffett to buy The World-Herald". omaha.com. Retrieved 2011-11-30. ^ Bloomfield, Susanne George. "Biography of Elia Wilkinson Peattie 1862–1935". Elia Peattie: An Uncommon Writer An Uncommon Woman. University of Nebraska-Lincoln. ^ "James Keogh; Time Editor, Nixon Staffer". The Washington Post. May 14, 2006. Retrieved October 6, 2012.